The goal of Animal Health, a unit of the Division of Animal and Plant Health, is to prevent the introduction and spread of contagious diseases among poultry and livestock, promote public health and food safety as it relates to zoonotic disease, to enhance the quality and health of livestock, and to maintain fair practices in the buying and selling of poultry and livestock. Our objective is disease control through regulation and education. We ensure the health of animals to ensure the public health. We provide technical assistance and law enforcement to control livestock and poultry diseases. Enforcement of permit regulations, prompt diagnosis of disease, surveillance testing programs, a reportable disease list, the accreditation of veterinarians, licensed livestock and poultry dealers and auction sales are key activities. The movement of livestock and pets entering Maine is regulated. 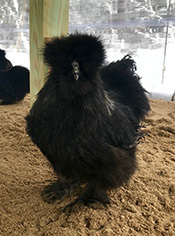 3/16/18 - Radio Show "Animal Chat with Dr. Matt" - DACF's Poullty Health Technician Donna Flint gives advice on poulty contact safety and interstate livestock movement. 2/16/18 - Radio Show "Animal Chat with Dr. Matt" - Discussed the collaboration between practicing veterinarians and State Animal Health Officials to prevent infectious disease from entering and spreading within Maine and to other states if a Reportable Animal Disease is found. Also discussed were animal welfare issues and the responsibility of animal ownership. 9/26/17 - Radio Show "Animal Chat with Dr. Matt"- A dicussion with State Veterinarian Michele Walsh about how the recent warm weather affects animals, the role of the State Veterinarian in protecting Maine's animals, and more! Information about bringing your pet dog or cat to Maine (Rules, Ch. 206 - Prevention, Control and Eradication of Disease of Domestic Animals and Poultry); page 17, section O. Information about bringing rescue or adopted dogs and cats to Maine.